A friend and I have been working and re-working the old Catachan Deathworld Veterans army list - huge amount of credit where credit is due to Chroma for the v1.5 list, and Dobbsy for the v2.0 update. Since the list seems dead, I've decided to start a new thread to share the work we've done tweaking, balancing, and expanding it. The current version is 2.7. To help the viewers following along at home, I will always post a version with important changes highlighted in red. I want to get these changes into the Experimental list, so here's the plan for discussion/testing. The current change up for discussion is highlighted. Once we agree these changes are ok, we can move to Step 2 and start tweaking points. Battle reports are always welcome! - Artillery Firebase (new) OK! - Is list building too open, or too restrictive? - What is an auto-take, what would you never take? - Do you see anything that's open to abuse? Last edited by GrimDarkBits on Tue Jun 06, 2017 12:43 pm, edited 4 times in total. My only suggestion so far is for your "Catachan Devils" They mainly seem to be the "Stormtrooper" "Karskin" Grenedier" equivalent for the list and i think their CC might be a bit too high. I'd recommend dropping them down to 5's for CC or alternatively dropping your FF down to 5's to compensate. They are a bit much with both. Besides that i like the look of the list so far. The traitor's bane needs an EA for the flamers IC to have an effect or you just need a note that the tank has IC period for FF. Jimmyzimms: my the intention was for the Heavy Flamer sponsons to confer IC on all firefight attacks (most of the weapons on the Hellhammer ignore cover anyway, so why not). Is there a different nomenclature I should use to make that clear? The regular Catachan Infantry units are anemic in assault. Between Inspiring and all the IC FF attacks, I wanted the Traitor's Bane to bolster them when assaulting enemy units in cover. It hasn't ever worked out like that in the games we've played though and my friend has stopped bringing it. We aren't sure if it needs changes, or what changes would make it feel more worthwhile - maybe changing the Hellhammer Cannon to 2BP, Disrupt, Ignores Cover, like in BlackLegion's stickied thread on IG vehicles? I'm going to encourage him to try it again as written in his next few games before we try any changes. Mard: although I didn't create these units, I believe the Catachan Devils are intended to be a step above Stormtroopers/Kasrkin. The Deathworld Veterans unit is the Stormtrooper equivalent in this list and the Devils are the "Marbo" equivalent for lack of a better comparison. Like Marbo in 40k, they should appear from nowhere and be murder machines. I would definitely like some people to try the Devils out - I think they're priced fairly for the unexpected threats they can set up but my friend feels they're a bit too expensive for what is essentially a one-shot teleporting MW unit with no staying power. OK then yeah the weapons FF IC being "and	(15cm) Small Arms IC" should work. I'd like a blast weapon myself otherwise why bother? . Oh and thanks for using a specialist name for the unit instead of trying to make a universal one. There's a reason the unit's not in the general lists. If you're wanting to run with it as the NetEA list (vs fan-list) I suggest you ping RugII about it and get his blessing since he runs the Guard here. I'm certain it's a minor formality and he'd be glad to see someone run it. Once my Ogryn-fanatic friend sees this, he will too! For Step 1, I want to be methodical and focus the few replies we're getting on one change at a time. If the rule/unit/formation doesn't seem controversial, we will move on to the next one. If it does, I'll ask for some playtesting or at least some math to show why it's a problem, and we'll test changes. Once we've made sure the new stuff is in the realm of sanity, we can move to Step 2 and start tweaking points and options to improve balance. And battle reports are ALWAYS welcome. I'll update the first post with this list and highlight the current task so anyone who reads the thread knows what's going on. First up, maybe an easy one: the Artillery Firebase. This is the Artillery Support Company from the Death Korps of Krieg list, cut down from 9 to 6 units. The Earthshaker Platform and the Gun Emplacements are identical so there are no rules to debate. However, the point value isn't exactly proportional; after some testing we dropped it from 400 to 325 because 6 units seem so much easier to keep suppressed/broken the whole game. What are people's thoughts on adding the Artillery Firebase formation to the list? What is a good point value for this formation? We can settle on final points later when we're working on internal balance, let's make sure we're in the right ballpark first. Thematically it's great. It really makes me think of US Marines at Khe Sanh vibe (the entire regiment theme in 40k). I need to run some maths when I am home and look.for synergies. Your outline approach is right on! I am the player who owns the Catachan army in Grim Dark Bits playgroup. I helped GDB pick up on the faction design expanding on the previous list. I figured I would chime in to add in to some of GDB's comments. Our little group has a lot of the factions and while we are generally pretty casual, I think at this point I have played against a lot of list types with multiple armies and verse a few players outside of the standard group. The Catachan Vet list is kind of weird and it fits into a niche I imagine other IG armies do not. Theme-wise the army is dead on so good work from Chroma and Dobbsy for the initial plans. Competitive-wise it needed some adjusting, but I think it is almost there now. The army is very infantry heavy and does not have the standard unit types (tank formations, titans, artillery types) that I kind of think form the backbone of the standard IG list. It was also missing lots of key elements like AA or strong AT. The infantry themselves are still just guardsmen most of the more serious units are in the support formation section. The result is that 3-4 formations of standard infantry always form the backbone of the army and you just have to figure out how to make them function. 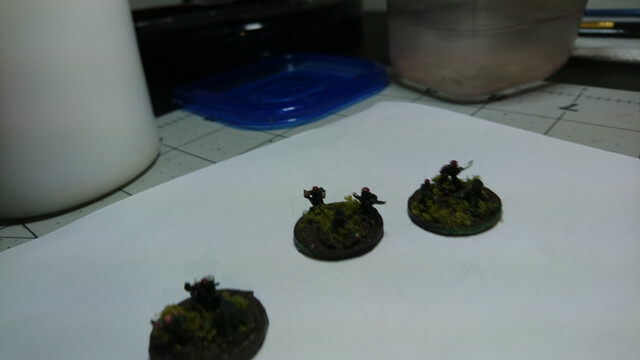 - Catachan Infantry and the Booby Trap rule (changed) - This rule is very fluffy and I love it, but as it stands GDB and I argue over how useful it really is. First Strike is a nice buff, but you lose access to AC on each squad and several free MWs and Inspiring from losing some commissar units. First Strike is pretty rare in most armies, but reducing it to half may have been a bit much. Standard guardsmen attacks are pretty low. It does do significantly btter with the Death World Veterans unit and the Devil team. (the devils can be murderous with it) Another downside, is it does nothing for the attack and GDB and I have been discussing the changes to compensate for it. - Catachan Mortar Team (changed) - The original designed was pretty off the wall so their change is warranted. They are basically light Griffons now with points that match. - Catachan Devils (changed) - This unit functions kind of like an almost terminator squad. There is one serious flaw in that the SR system kind of adversely hinders them more than it probably should. Going second most of the time means you don't get the shock effect you get with Termies and more often than not you are just using them as a 300 point distraction. They just don't have the numbers or durability. If you can pull it off though, you get a nice little squad that can cause some pain. - Catachan Valkyries (no change, but potential exists for a 16BP shot from a large formation) - This one is strange, but it is just a result of the kind of wonky BP system. Once per game you can get that 16 BP shot and it can be pretty devastating. It is probably the one thing that could be considered OP in the list. Essentially you take an air cav company and add in 3 upgrades that take Valkyries. The best option is 3 Ogryns upgrades with Valkryies giving you 8 in total. The result is you can add massive blast markers and casualties to a single unit. If you do it right, you fly up and drop off your infantry right in his face and then hit the enemy strong point. Then you retain the initiative and charge with another squad and have the Air Cav provide supporting fire. The Ogryns form a meat shield and both formations wreck shop with all face with mass attacks. Right now this unit is the best way the list has for dealing with large formations in transports. - Artillery Firebase (new) - Will save this one for the next post. - Traitor's Bane Hellhammer (new) - We added this unit in specifically for fluff. The original list has NO super heavy units in it and they don't really fit in the theme of Space Rambo. That aside, Epic is suppose to be about large battles with massive units so we came up with a reason to throw this in for the fun of it. The current version needs a bit of a boost, but most of its problems are due to Baneblades being just meh. - Catachan Missile Team (new) - Originally the list had no AA. At some point we added in the hydra for use, but I usually take these guys because it is more thematic. As it stands they are necessary additions and the extra damage verse vehicles is nice. - Vulture Squadron (new) - I think GDB missed this one. The base list is has very weak anti-tank. The unit is directly imported from the Elysian Drop Troop list. It makes sense though in Team Space Rambo as its just a helo hunter killer pack. Overall the current list feels like it has a lot of strengths and weaknesses and is pretty competitive, but not off the wall. It plays well and I don't think anything is too OP. It is also very fluffy and fun. I will post up a battle report I wrote a few months ago next. Last edited by Yvain on Mon Mar 06, 2017 12:42 pm, edited 1 time in total. We deployed and he put his guys in a line with a unit in the thunderhawk and terminators teleporting in. His biggest unit was on the far left next to his objective. His Chosen were garrisoned up in the center. I put my squads as depicted in Deployment shot.The mortars squad was in the far right building, which are hard to see. In the center was the standard infantry squad and the left the HQ section. The way we played cover was you can't see through terrain past 10cm and units base to base with cover count as inside. I managed to win Initiative turn 1. I started by putting up Cap and having my center squad rip into his Chosen breaking them. He responded by moving his land raiders and thunder hawk in to flank my right side cutting into the mortars and putting pressure on my center squad who rolled hot with their cover saves all game. He attacked hard on my mortars, which saw my CAP ripping into both his Thunderhawk and Fighters who didn't survive to fly off the board. I moved my units up to put pressure on his left my ultimate goal being to take out his commander unit. While doing so I shaved off some units from his broken chosen as they were the only squad I could hit. Vultures hit the knights with missiles, but reinforced armor and invul savs are tough to get past. Turn Two: I failed both rolls for teleporting units and then for getting initiative first. His strategy rating is simply too high for me to beat unless he rolls a 1 or 2. He dropped his terminators in and killed my Earthshaker platforms and then retained the int and shot up more moved his Land Raiders up killing my Vultures. I moved my Valkyries up and hit his Commander with everything breaking the units and dropping it down to a few bases. He picked up his far right squad with the thunderhawk and move infantry up to put pressure on my center company. I used the Hellhammer and Regimental HQ to kill off his Terminators. He failed his active roll for this knights so they just moved forward. I used Thunderbolts to add more markers on them and to remove some units from his fleeing commander unit. Turn Three: Here I was in position to take 3 points and win the game. So I made a play and teleported in the Devils near the center to try to stop his knights. No surprise he won initiative and then charged and murdered them. Then charged the center squad and murdered them as well. Both times he summoned daemons basically killing the squad before I could do much real damage. My goal heard was to obtain his back objective and then the objective in the building to score two points and kill his remaining base from his commander squad while also denying him from scoring two points. I could do nothing about most of the squads on the board. So I moved the commander up and had him take out the smaller chosen squad to keep them from contesting either objective. Then I used the Hellhammer to continue contesting the middle objective and to shoot his Knights (he whiffed). He rolled for his Thunderhawk and it failed to arrive because of excess blast makers. So I hit his Knights again with Thunderbolts. Then he moved his Land Raiders up and took my back field objective, which I could do nothing about. From here, I moved my valkryies squad up and put a wall in front of both objectives while scoring both. I risked a roll and retained the intitive and moved in with my last activation of Thunderbolts. I scored some lucky hits on his Knights breaking the formation finally and securing the 3-1 victory. Last edited by Yvain on Mon Mar 06, 2017 1:27 pm, edited 1 time in total. Heading back to GDB's design plan. The Artillery Firebase unit was something IDed right away the list needed. With out serious long range fire power, any IG list is going to end up behind the other factions due to the weaknesses in it units. It also fits well into the Vietnam War, Space Rambo theme we were shooting for. The weaknesses listed above make the points cost make sense. Back from a long hiatus. Thanks for the input, Yvain. I do remember now that we dropped the Artillery Firebase points to make up for shortcomings in the rest of the list (the lack of effective AT, I think?) and not because it was easier to suppress like I said above. Mathematically it's no harder to suppress on a unit-for-unit basis, and the BP table scales pretty well with formation size too. As a result I have a feeling the Arty might be a little too cheap now and it's other less effective options in the list that need their points trimmed. It's always easier to set your own value for a "new" unit than to argue why existing formations/upgrades from other list needs their points adjusted, so we took the easy route. Anyway this might be a longer discussion and no one seems fussed about it. Thematically people seem to like the Artillery Firebase, points-wise we don't have any complaints. I will re-open discussion on the Artillery Firebase if people object to the point value later, otherwise let's move on. This unit/upgrade/formation changed significantly from Dobbsy's rules. Originally the unit had an indirect fire AP/AT weapon, but that made it an effective armor-sniping unit. It helped fill an AT gap in the list but it made no sense thematically. With the addition of the Artillery Firebase, long range AT is a little less of an issue. In the new revision, for every two Catachan Mortar Squads (rounding up) you get 1 BP at 30cm, Indirect. I'm leveraging the "1 per 2" rule that seems common in Guard lists because it gives the right "feel". You get a sturdy little 6 unit formation for a reasonable price, and your man-portable mortars aren't inexplicably hitting as hard as a Basilisk unit-for-unit. Essentially two Mortar Squads have the Indirect firepower of a Griffon. Two Mortar Squads can be purchased as a formation upgrade (Catachan Mortar Section) for 25 points, or a formation of 6 (Catachan Mortar Platoon) can be purchased for 75 points . On staying power and effectiveness, I would call it a wash, but the extra activation calls for a points increase. I believe the unit is a little hard to price because 75 points is such a cheap activation, but 100 points is too much for 6 INF units with mediocre firepower. So far we haven't been able to build lists that spam them effectively. The Core Formations seem to need so much support that wasting points on Mortar Platoons isn't a good option. I welcome any feedback people have on the Catachan Mortar Squad and the mortar upgrade and formation. In particular, how do you feel about the 1 BP per 2 units weapon, and how do you feel about the prices? Looking at the rest of the list, could you ever see yourself taking more than two Mortar formations in a 3000 point game? The mortar squads in their original designed were definitely necessary due to the gaps in the list. However, as we started to tweak and add unit to fill out space Vietnam/Rambo theme, it quickly became noticeable how OP they were. With the current rules, these guys are essentially infantry Griffons. This has its pluses and minuses. You can't attach them to anything really bump up their BP. Their low range means unless you sustain fire, you won't get a shot in. They are easy to remove. Their main advantage is because they are all infantry, you can easily buy a cheap squad to garrison them with or take them as a group of 6 to get an extra activation. As it stands now, I think they are bit over priced at 75. They are certainly useful, but not so much that I would take tons of activation of them. The way the Catachan list is designed, can only really take infantry companies as base formations. With only two support formation upgrade per squad, if you were to spam mortars you would eat up your points in basic infantry units. Catachan Companies don't have autocannons so you will end up with tons more infantry fire power and no where near enough anti-tank. Right now you have a slightly overpriced griffon, which while useful doesn't really match the current strength of the uniit.